Jelavic in detail – Why have the goals dried up? Our series of player focus reports continues with a look at Nikica Jelavic in the most recent match against Cardiff City. After a slow start to the season, supporters have been unanimous in their appeals for a cutting edge at the top of the Everton attack. All too often this season, Everton have controlled possession, dominated territorially, but failed to turn the pressure into goals. So, is it the strikers who are guilty, or does the blame rest with the team’s creative players for failing to generate enough clear-cut chances for the centre forwards to score? In the Cardiff City match, despite controlling 63% of possession, Everton only managed 13 efforts at goal, with just three of those shots on target in the whole game. That in itself is a pretty damming statistic and highlights concerns that the Blues are not showing a clinical edge in front of goal. In fairness to Nikica Jelavic, of the two efforts on goal he managed in his 68 minutes on the pitch, one was well saved by David Marshall in the Cardiff goal, although his other was a poor finish wide of the target after good play from Ross Barkley. But why did he only have two opportunities to score. 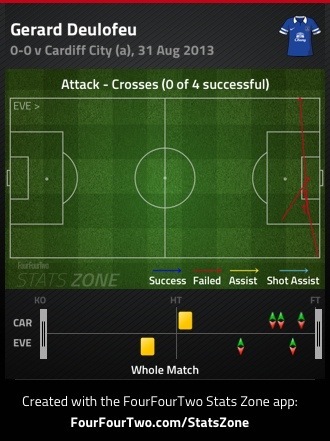 Is Jelavic not getting on the end of chances, or did Everton fail to present him with enough opportunities? If we look at Jelavic’s heat map, we can clearly see that the Croatian striker spent too much time outside of the danger zone. As the possession stats demonstrated, Everton dominated this match and put a massive 33 crosses into the box, however worryingly for Martinez and Everton, Jelavic spent very little time inside the penalty area, significantly reducing his opportunities to score. Jelavic is at his best when he plays with instinct. His first time finishing is excellent, but Everton’s rather protracted slow build up play has inevitably reduced the space available for the striker to score. However, Jelavic also possess outstanding movement, allowing him to pull away from his defender and get on the end of dangerous balls into the box. This in itself makes it frustrating that until now, Jelavic and the exciting Deulofeu have not figured on the pitch at the same time. Deulofeu was only on the pitch for 5 minutes in the match against Cardiff, but in that time delivered 4 excellent crosses, all in and around the 6 yard box, all of which were begging for a poacher to anticipate and score. On each occasion, substitute Arouna Kone was caught flat-footed and the other Everton players failed to anticipate the Spaniards intentions. Despite his lack of goals Jelavic hasn’t been afraid to work for his team mates. A look back at the heat map above shows his willingness to work the channels, making several runs down the flanks to provide space for the midfield players and allowing the likes of Kevin Mirallas and Ross Barkley to make runs into the box. 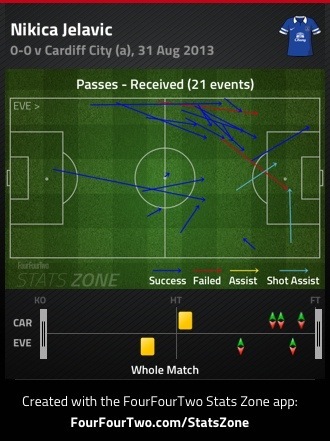 One positive aspect of Jelavic’s play was his link up with the Everton midfield. The former Rangers player completed 100% of his attempted passes in the game and he regularly made himself available for his teammates, collecting the ball 19 times, out of 21 attempted passes into the striker. 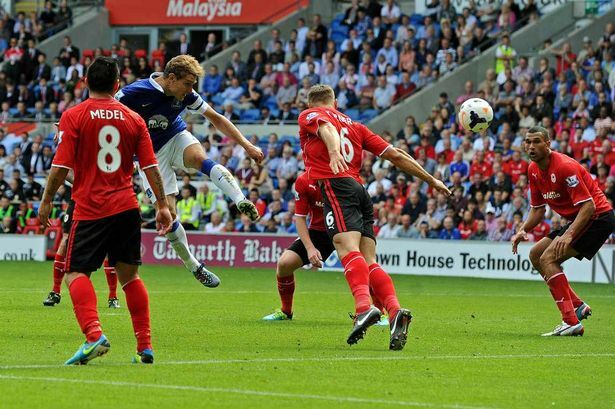 After an excellent pre-season, it has been a big disappointment to see Jelavic again struggling for goals. The arrival of the on-loan Romelu Lakaku is sure to limit Jelavic’s opportunities on the pitch. Jelavic is however likely to get one more chance to steak his claim for a starting spot, with Lakaku unavailable for the next match against his parent club Chelsea, due to Premier League rules. It would also be unfair to blame Jelavic for the lack of wins in Everton’s opening fixtures. He has certainly not missed a hatful of opportunities, but as Arouna Kone found in the Capital One tie, a Premier League striker is expected to take their opportunities when they arrive. Frustratingly, Everton have put a significant number of balls into the box. 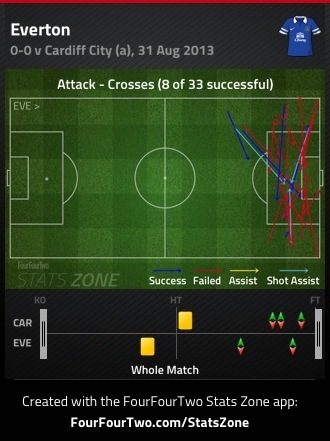 Of the 33 crosses into the box, only 8 were successful, with the other 25 failing to reach their intended target. This more than any other, is the most damning statistic and Everton must improve on their final ball if they are to turn possession and draws into Premier League wins. Evertonians would certainly relish the return of the in-form Nikica Jelavic who plundered 11 goals in his first 16 games for the Blues. However, with just 1 goal in his last 23 Premier League matches, the Croatian will need a huge change of fortune to fend off the challenge of new arrival, Romelu Lakaku. Next Post James Vaughan – could he still have an Everton future?